I was at the optician today with my mum. She and the kids go every January for new specs. Every other year I join them for new reading glasses but as an adult (as opposed to an under-16 or over 65), I only get a free sight test every second year, so I don't bother paying for one unless I feel my prescription has changed noticeably. While mum was having her eyes tested, I played around with the glasses, deciding what I'd buy if I won the lottery (which I don't play) at the weekend. My prescription feels ok, but my glasses are loose and annoying and constantly falling on the ground when I bend over. To be honest, they're driving me batty at the moment... So, I found a lovely blue pair, tried them and felt how nice and tight they were, then put them back. When I picked Léon up from school I was recounting my afternoon to him. 'Would you really like them mum?' he asked. I told them it was fine, I could live with my current ones. But he's a sweet boy, so he suggested 'They always do two for the price of one in that shop so instead of me getting a spare pair, or sunglasses this year, I'll pretend I want the blue ones (even if they are meant for ladies!) and order them as my spares, then when we get home, I'll give them to you! They'll never know!' 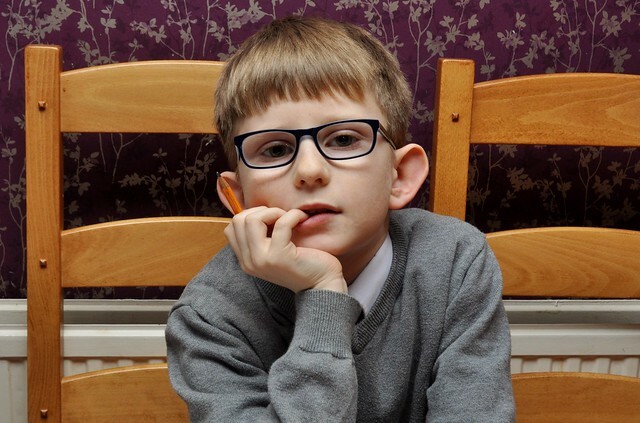 I can see one wee flaw, given they'd make up both sets of his glasses the same - he needs +5.00, as he's really long-sighted, but my reading glasses are sitting around +1.50. I'm not sure his kind-hearted, if fraudulent little escapade is really going to help either of us! But he has a good heart, the wee soul. 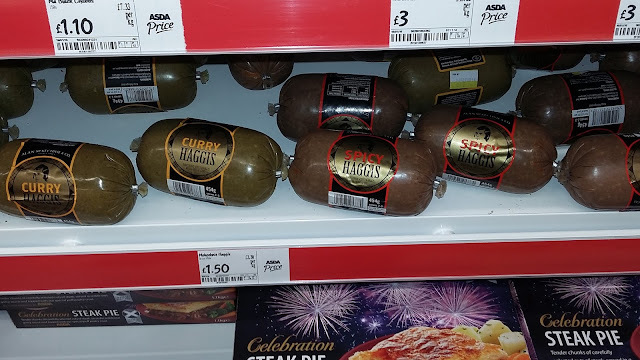 I spied this in Asda the other night while I was shopping for culinary items to celebrate what the kids fondly refer to as 'the night daddy talks to a haggis'. I love the inclusive way Scots are open to adapting their national dish to move with the times! Like all six-year-olds-to-be Amaia had fixed plans and ideas for her birthday. 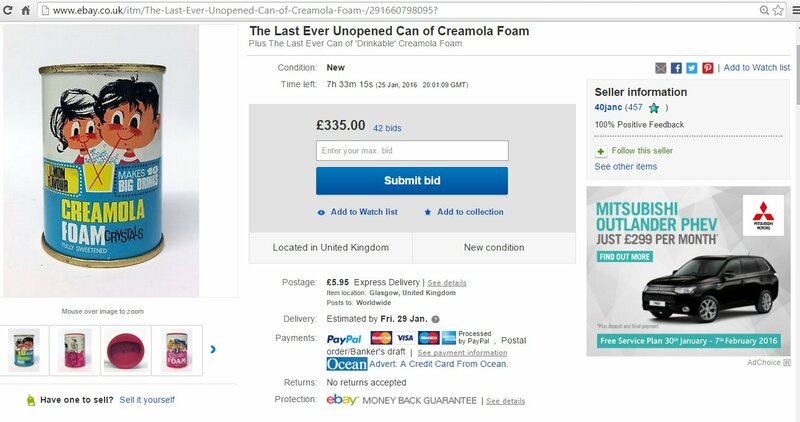 For about ten months she'd been telling me which kids she wanted to invite round for cake, and her gift ideas came in around Xmas. But unlike most children her age, she seems to have quite grown-up tastes too. When asked what she'd like for dinner on her birthday we didn't get a request for a trip to the local Mcdonalds for Happy Meal, or even a Pizza Express offering. She wasn't content with a homemade kiddie favourite such as mac and cheese or burger and chips. Nope, she asked for rabbit stuffed with pancetta, rosemary, sage, wild fennel and garlic, rubbed with olive oil and oven baked in white wine!!! It's a meal she's only had once before when she was four at her grandparents' Italian friends' house in Tuscany, but it definitely impressed her. Fortunately, we managed to track down two bunnies in Makro and we managed to get the recipe from Enzo and Franco. So when it was served up on Monday evening she was very impressed. So impressed in fact, she told us that she'd have one of the rabbits and the rest of us (including granny) could share the other!